Dr. Chou's research interest centers around the understanding of life, or living systems. Towards that goal, he works on two complementary scientific front ends. In computational biology, he studies how to best analyze the vast amount of biological data generated by recent advances in genomics, transcriptomics and proteomics. These techniques allow us to gather biological data at exponential rate, but to analyze these data efficiently requires the creation of specialized and more efficient computer software. Dr. Chou has created automatic DNA sequence clean up programs (Lucy1 and Lucy2) to help biologists improve their data quality, an efficient whole genome oligo microarray design tool (Picky) to help biologists design their own transcriptomics experiments, and an automatic Perl programming tool (Vect) to help biologists create their own bioinformatic solutions. He is actively working on a new project with his students from both bioinformatics and molecular biology backgrounds to create a design software for RNA interferences. 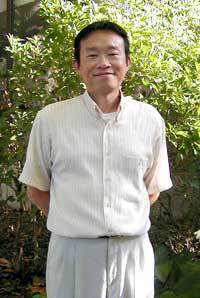 Dr. Chou is also interested in a synthetic approach to study life, or the artificial life research. This approach attempts to grasp the principles of "life" within a computer without touching the implementation details such as DNA or proteins. Dr. Chou has created a complete programming and simulation system (Trend and jTrend) for the cellular automata modeling of self-replication process, an essential ingredient of any living system on earth. By combining these two complementary research approaches, Dr. Chou hopes to one day take us a bit closer to answering questions such as "what is life? ", "how does life emerge? ", and "how does life compute?". Dr. Chou is an associate professor in both the Genetics, Development and Cell Biology and the Computer Science Departments at Iowa State University. He is also associated with the Bioinformatics and Computational Biology (BCB) Graduate Programs, the Interdepartmental Genetics Graduate Program and Bioinformatics and Computational Biology Undergraduate Major. In addition, he is a member of the Lawrence H. Baker Center for Bioinformatics and Biological Statistics, the Center for Plant Genomics under Plant Sciences Institute, and the Center for Integrated Animal Genomics. While not doing research or teaching, Dr. Chou likes to travel the world and capture the beauty of nature using his camera. Having taken slide films for some 20 years, he has just recently switched to using digital camera. Some of his pictures can be seen on his personal website. Last modified June 13, 2008. All rights reserved.